Mansfield Town manager David Flitcroft felt his side struggled to get to grips with Northampton’s ‘direct’ approach during Saturday’s 1-1 draw at the PTS, adding that the referee didn’t help matters. The Stags arrived in Northampton chasing a third successive win and sitting second in Sky Bet League Two, and it was going with the form book when Mal Benning’s early corner deceived everyone and went all the way into the net. 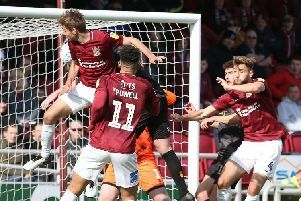 You want a referee to keep the game flowing but it was stop-start and does that suit Northampton? One hundred per cent because it allowed them to get players on the edge of our box and smash it in. 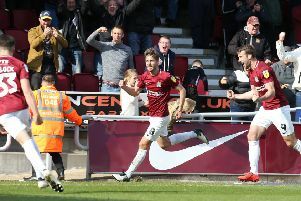 But Flitcroft’s men were well below their best and the Cobblers deservedly bagged themselves a point courtesy of Sam Foley, who headed in Scott Pollock’s corner with 21 minutes to go, denting Mansfield’s promotion aspirations as they dropped a place to third. “It was a well-earned and hard-earned point,” said Flitcroft. “The football we came up against today was direct and it came at you from every angle. “Northampton are in transition. There’s a lot of uncertainty with contracts for next season and sometimes out of that you get players fighting for everything and they certainly did that because we’ve had to withstand quite a bit of pressure. “The disappointment is that we were 1-0 up and the goal we conceded comes from a set-piece because we dealt with their other set-pieces really well. “Northampton are very brave on corners - they throw nine outfield players in and they really come after you but we withstood it for most of the game. But the one we didn’t get right, they score from so that’s where I’m really disappointed. “I thought our early goal would settle us but it didn’t because we rushed out play, we weren’t composed enough in possession and we stayed in that frantic state of mind. Flitcroft was also unimpressed by the performance of referee Paul Marsden, adding: “The referee broke the game up a lot and I didn’t think he really understood the importance of it. There was also a penalty claim for handball and I’ve got to see that back again. “At times it was like he was guessing. I’ve never seen so many free-kicks in a game without seeing a big tackle so it was a scruffy match and not a great spectacle. “You want a referee to keep the game flowing but it was stop-start and did that suit Northampton? One hundred per cent because it allowed them to get players on the edge of our box and smash it in.